Yesterday, I made a Paleo Banana Bread for the first time. While the ingredients are technically Paleo-friendly, the delicious outcome is still a treat, and we won’t be making or eating banana bread every day or every week or month for that matter (I just had some bananas I needed to use up!). Some people who eat Paleo don’t avoid all dairy, and some do – we hardly drink milk nowadays (it’s been purchased a few times this year for special recipes), but we haven’t given up cheese. Some people who don’t drink milk or eat cheese still do use grass-fed butter though, and let’s face it, everything tastes better with butter. 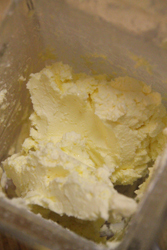 So today, I decided to use up the heavy cream we had in the fridge from one of Nick’s AWESOME gourmet meals, and make my own butter. 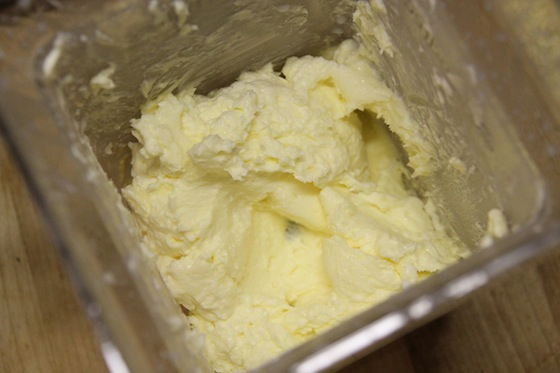 Unfortunately, we still haven’t gotten easy access to grass-fed milk or cream, so this is just organic cream, but it will make butter all the same. 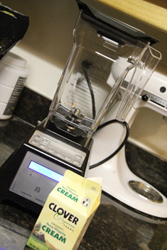 I put two cups of heavy cream into our trusty Blendtec blender (another very cool INDT tool for us besides our awesome grill), and according to the manufacturer’s cookbook, I blended it on level 2 for 15 seconds. This blender is so cool – it had already turned the stuff into super thick whipped cream – it actually looked like soft-serve! Then came the more tedious part. 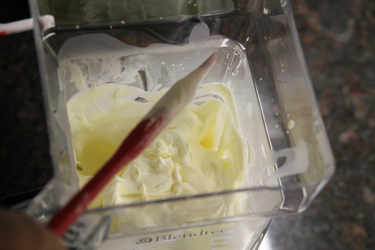 I had to alternate pulsing the mixture and using a rubber spatula to push the thickened cream (getting more and more like butter with every pulse) to the middle of the chamber. The book said I’d have to do this maybe 10 times, and it was spot on. It was really neat. 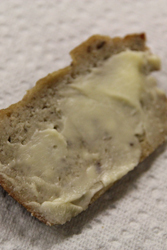 The mixture went from something thick, creamy, and airy looking … to all the sudden started looking rough-textured. 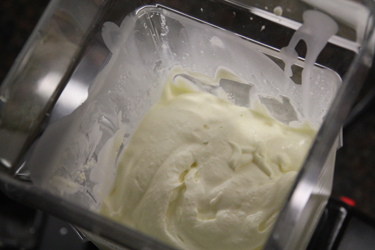 This was the butterfat separating from the water in the cream – neato! 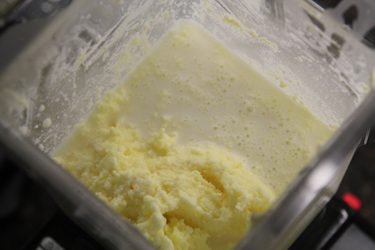 When the almost-butter looked about the same on each pulse, I started kinda smooshing (a very technical term) the butterfat together and squeezing the water out of it with the rubber spatula. 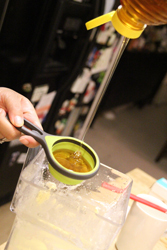 It seemed so weird to do – squeeze liquid out of fat – but I got about a cup of buttermilk out of the mixture. 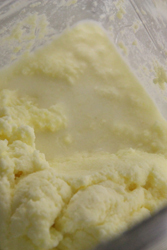 It’s interesting to note that this isn’t the same thing as the cultured buttermilk you see in stores – originally when butter was made, milk had to sit out for a while so the cream could rise to the top, which by then was a bit fermented, resulting in a tart buttermilk. 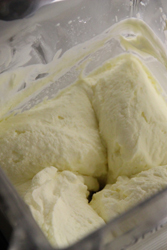 Today, cream separators are used, so the natural, gentle fermentation no longer happens before butter is made, and today’s buttermilk is created by adding cultures to fresh milk. 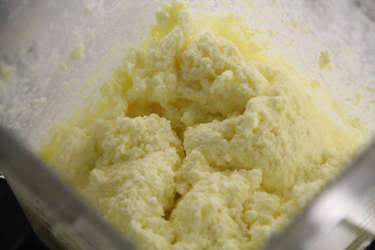 After squeezing as much buttermilk out as I could, another recipe I had looked at before said I should “wash” the butter, by putting fresh, cold water into the blender jar and blending it with the butter for about a minute, changing the water after each processing period, until the water ran clear. 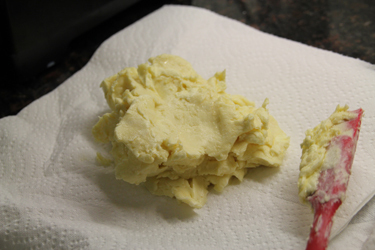 I did this several times, and each time the butter got colder, more firm, and a bit harder to work with, which was good (my butter was firming up nicely!) and bad (argh, so hard to work with!). Finally, I squeezed as much water as I could out of my butter mixture, by packing it against the side of the jar and pushing the water out, and I added 1/3 cup of honey to the mix. I blended the honey with the butter on “1” in spurts of about 15-20 seconds, scraping the butter to the center after each blend. After a few goes, the honey was incorporated nicely. The mix still seemed a little watery though, so I emptied it out onto several layers of paper towels, and tried to squeeze as much water out as I could. 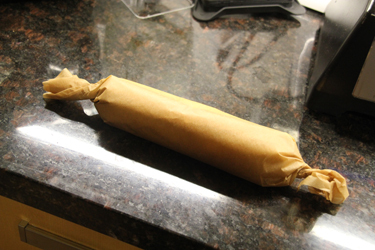 Then I formed the butter into a log and wrapped it in parchment paper. I think I’ll freeze it, since we don’t use honey butter much, but of course I had to try a little on the yummy banana bread I made yesterday. So good!